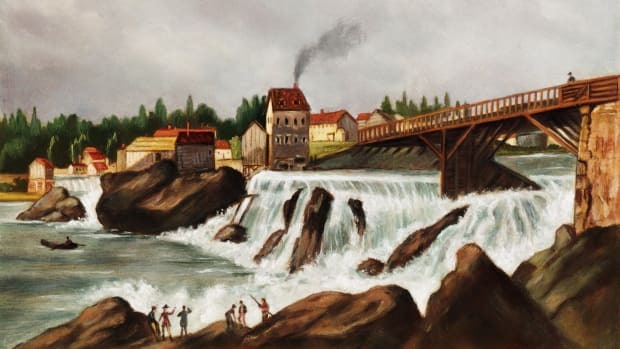 The first factories were built in the 18th century, with British textile mills that spread to the United States, a time known as the First Industrial Revolution. 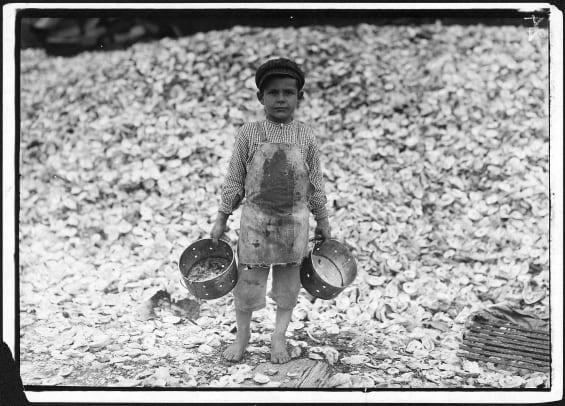 Then innovations in production line technology, materials science and industrial toolmaking made it easier to mass produce all kinds of goods that remade the American family and physical landscape. Factories produced sewing machines for home use, steel girders for skyscrapers and railroad tracks that cut through the plains and mountains. 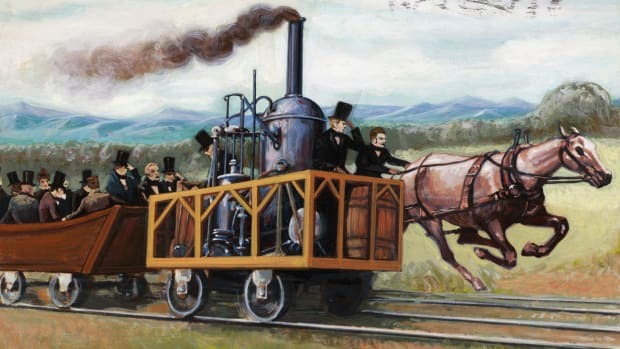 Long-distance transportation networks connected by rail, steamship and canals opened new markets for farmers, factory owners and bankers who could bring America’s natural resources to a global marketplace. For the first time, goods from the American heartland could be shipped long distances, eliminating the need for local bartering systems. 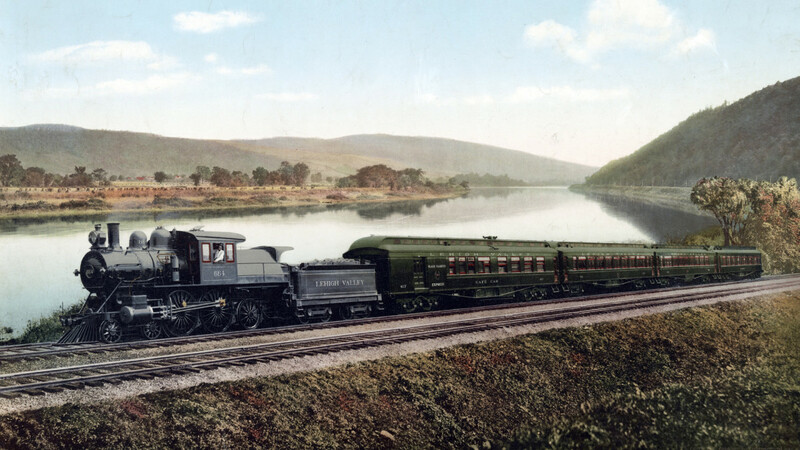 Black Diamond Express train on the Lehigh Valley Railroad in Pennsylvania, circa 1898. Railroads were largely responsible for this great burst of economic production, according to Richard White, a Stanford history professor and author of Railroaded (2001). The iron chariots also changed the human and natural environment of the West, and of course led to conflicts with Native Americans who had lived there for generations. “If a Western Rip Van Winkle had fallen asleep in 1869 and awakened in 1896, he would not have recognized the lands that the railroads had touched,” White writes. “Bison had yielded to cattle; mountains had been blasted and bored. Great swaths of land that had once whispered grass now screamed corn and wheat." Railroad lines expanded from 35,000 miles in 1865 to 254,000 miles in 1916. Yet after World War I, the railroad would be replaced by the automobile. With his emphasis on vertical integration of parts and assembly line manufacturing, Henry Ford was its king. At its peak, the Ford Motor Company factory in Michigan employed 40,000 workers under one big roof. 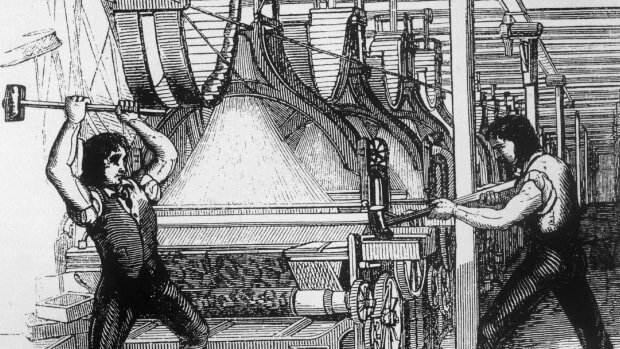 While some historians quibble over the exact boundary between the First Industrial Revolution, that began in the mid-18th century, and the second, that started around the mid-19th century, a primary difference is that the second saw the beginning of mass production in manufacturing and consumer goods. 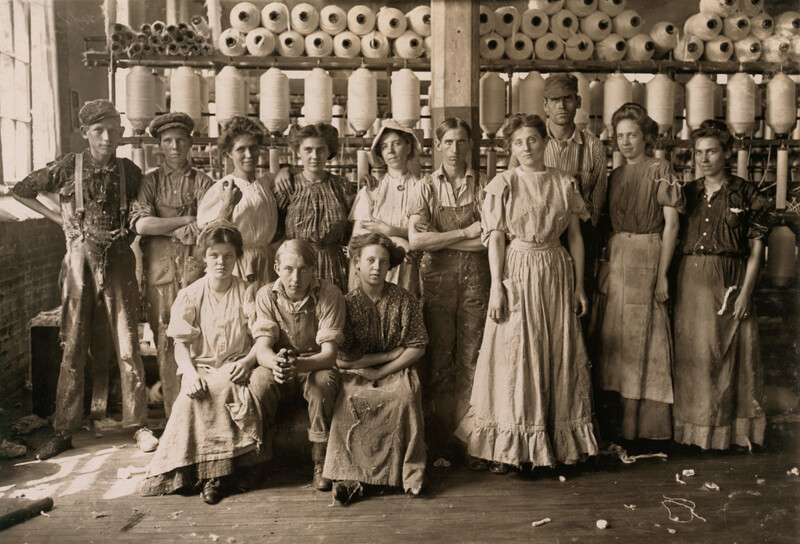 Cotton mill workers from Indianapolis, circa 1908. Household items like soap, butter and clothing that used to be made at home started being made in factories as well. And factory workers—including women—then had the money to buy these products. At the same time, all kinds of goods became standardized for the first time, according to Priya Satia, professor of international history at Stanford University. For example, industrial standardization marked an evolution in the arms industry, says Satia, author of Empire of Guns: The Making of the Industrial Revolution. 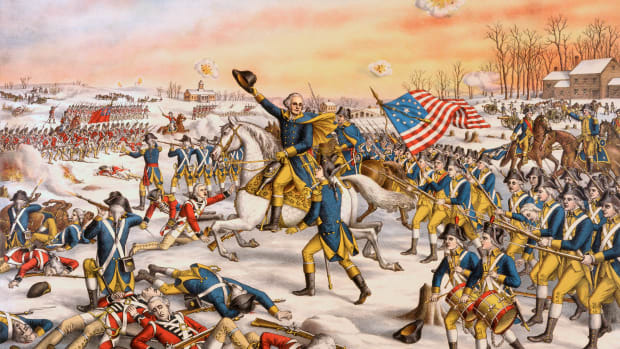 READ MORE: The History of Firearms in the U.S. 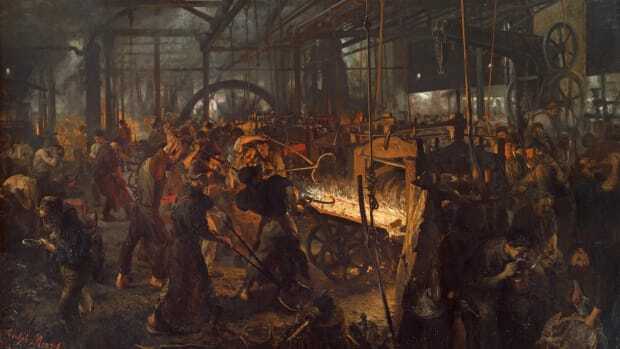 The changing world of the Second Industrial Revolution also led to fears by social critics about the loss of freedom, autonomy and independence that is replaced by boredom, repetition and toil, according to Freeman. Early 20th-century films like Fritz Lang’s sci-fi dystopia “Metropolis” or Charlie Chaplin’s assembly line comedy “Modern Times” capture this fear of the factory worker as a human robot. 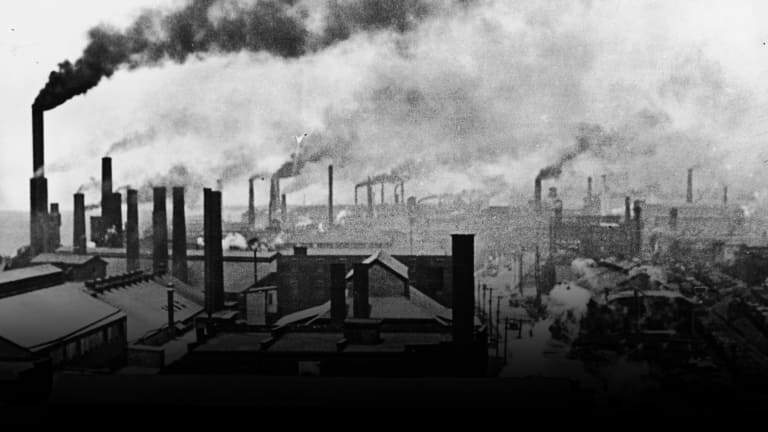 The Second Industrial Revolution ended just before World War I, historians say. 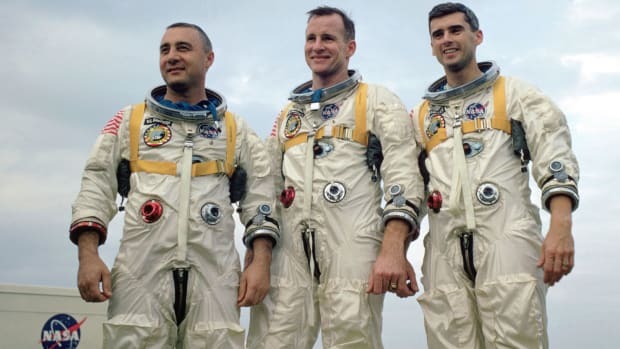 It has been followed by the Third Industrial Revolution in which digital communications technology and the internet changed how we transmit information, do business and interact with each other. Some argue we are now entering a Fourth Industrial Revolution, in which robotics, artificial intelligence, autonomous vehicles and biotechnology are changing our concepts of both life and consciousness. The trajectory of this phase of human development must wait for future historians to write.